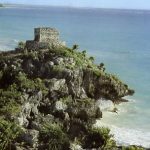 After spending a week enjoying the leisure life of the Mayan Riviera, we were excited as we boarded the bus for historic Tulum, edging this flourishing tourist region of Mexico. A land of greenery and white sandy beaches edged by a deep blue sea, it leaves an image of paradise on one’s soul. 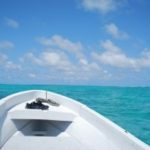 In addition, it offers lagoons, ancient Mayan ruins, ecological reserves as well as the world’s second largest coral reef. I hardly slept the night before, so involved were my thoughts in travelling back a thousand years to a world of Mayan splendour. Considered the most beautiful of the Mayan ruins, Tulum is imprinted on a visitor’s mind as no other city from Mexico’s Indigenous past. It was only a short drive from our hotel to Playa del Carmen until we reached the outskirts of the ruins of Tulum, the most splendid of the Mayan cities. After descending from the bus, we then walked a short distance to the entrance of this city built along the coastline of the Mayan world. Tulum, like the Mayan city ruins of Cobá, El-Bekem and Chichén Itzá has been, to some extent, excavated and made accessible to tourists. 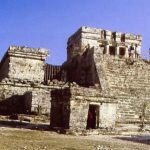 The Mayans, one of the world’s most original and enigmatic peoples, created the greatest of Mexico’s native civilizations until overpowered by a series of other indigenous tribal nations and finally subjugated by the Spaniards. However, they have survived until our time, maintaining their language and way of life, more than any other of the country’s indigenous peoples. On the whole they were historically a peaceful race. Even though, at times, warring against each other and practicing human sacrifice, they worked at developing both art and science and their artistic and scientific achievements were spectacular. With every archaeological discovery, the expanse of their achievement appears more wondrous. Their observatories for star-gazing and their understanding of the mysteries of the planets and stars were incredible. They could make astronomical calculations at least 90 million years into the past and accurately predict eclipses of the sun and movements of the moon. Their scholars perfected a solar calendar, more precise than the contemporary Julian calendar – as accurate as any currently in use. They may have achieved much more, but we will never know. 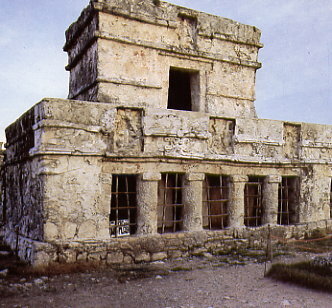 The Spaniards in the early 16th century destroyed the libraries of rare manuscripts which the Mayans had preserved from their days of grandeur. Believing that their historical codices (painted books) carried messages heretical to Christianity, they were burned by the Church which regarded them as works of the devil. The Conquistadors had come to plunder the indigenous peoples’ gold and bestow on them their Christian God. 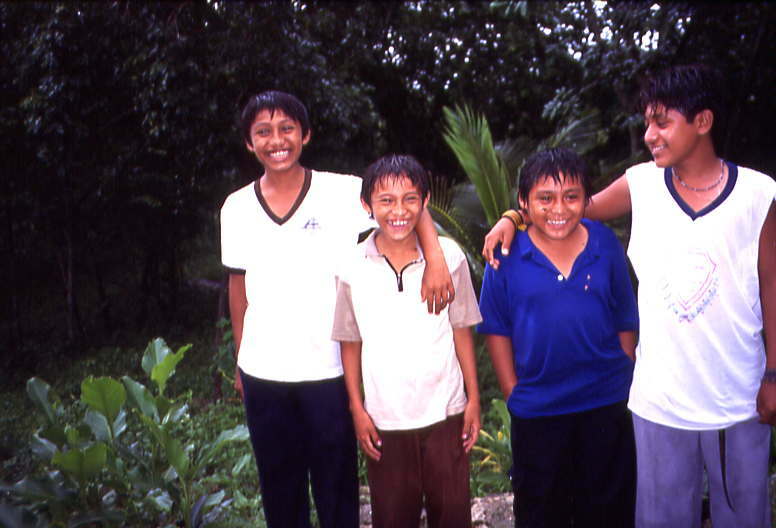 In the ensuing centuries, the Mayans, regarded by the Spaniards as subhuman, rebelled again and again. However, they were never totally subdued, retaining until this day their ancient way of life. After a 10 minute walk from the bus, we stood by the walls of this Mayan town, poised on a 15 m (49 ft) high limestone cliff, overlooking the Caribbean and surrounded by thick jungle. 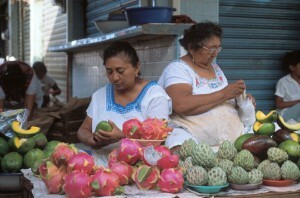 Known once as Zamá (morning), for the Mayans it became the ‘City of Dawn’. Built in honour of the sun, it edges the second longest coral reef in the Americas that a short distance from shore falls down dramatically to 469 m (1,400 ft). 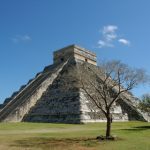 Many consider it the most fascinating of the ancient Mayan cities found in the Yucatán Peninsula. 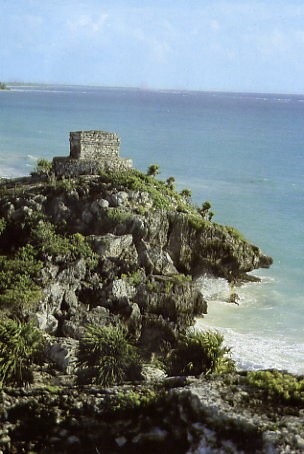 Tulum, which means ‘wall’, was a name later given to the site because it was the only Mayan city protected by a wall – 4.6 m (15 ft) high and 7 m (20 ft) wide, much of which still stands. We entered through five narrow gates that were built as a defence against the fierce Caribe Indians. 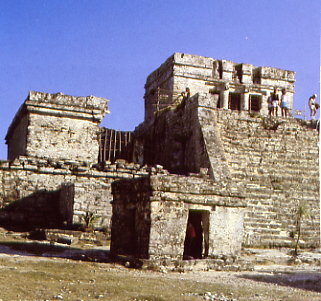 Of all the Mayan urban centres, it was the only sizable town built on the coast and the only one inhabited when the Conquistadors arrived in 1518 A.D. Even though it was founded 1,500 years ago, most of the present structures are no more than 800 years old. Once built to keep watch on the coastline, it is now a place of silence and desolation, except when filled with 21st century tourists. 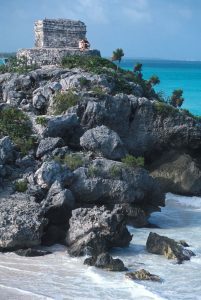 Perched on the highest point of Tulum’s cliff is El Castillo which was the Mayan temple dedicated to Kukulcan, the serpent god. It dominates the setting and commands a broad view of the sea and the surrounding jungle and may also have served as a beacon for mariners. It is said that standing atop this temple, as the Mayan priests had once done, gives one a feeling of intense contact with God. We spent a few hours examining all the uncovered ruins but felt relaxed as we were being soothed by the fresh breezes flowing in from the Caribbean. At the Temple of the Frescoes, we tarried awhile to examine the partly restored murals depicting Mayan gods and symbols of nature’s fertility such as corn, fish and rain. Our last stop was the Temple of the Descending God. Over its narrow doorway is carved a tiny figure that appears to be tumbling down from heaven. The descending or diving figure, whose significance is not known, has made the temple a place of reverence for believers in unidentified flying objects. In fact, the whole of the ruins of Tulum have become a shrine for those who maintain that earth was once visited by tiny aliens from another world. 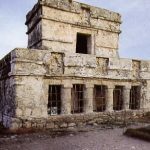 It was getting dark when, happy and content, we boarded a bus to return to our luxury abode – still thinking of the Mayans who had created one of the greatest civilizations in the Americas. 1) The coastal area of the Yucatan Peninsula has a tropical climate. It is therefore best to wear cotton-based fabrics. 2) In the Mayan Riviera, the use of regular sunscreens is prohibited for all water activities in the ecological parks, as part of the preservation of water-life ecology. 3) Beware! It is a criminal offense to take artifacts or souvenirs from the sites or out of the country. 4) The official Mexican currency is the peso currently trading at around – 13.5 pesos to a US dollar; 12 pesos to a CDN dollar. However, at times both currencies are exchanged by some businesses at the same rate. 5) The usual tips for baggage handlers and bellboys is $1.00 per suitcase; maids $1.00 per day and 50 cents for washroom attendants. 6) Visitors to the Mayan Riviera should try the Mayan-based dishes: Sopa de lima, chicken broth with lime; codzitos, fried tortillas topped with tomato sauce and cheese; poc chuc, grilled pork with pickled onions and a sour sauce; panuchos yucatecos, fried tortillas filled with black beans and other goodies; pibil, a pork or chicken dish baked in banana leaves; and papadzules, tortillas with eggs, pumpkin seeds, tomato sauce and grilled seafood, are some of these foods. 7) Some of the Mayan handicrafts offered in the Mayan Riviera are hipils (white cotton dresses with colourful designs), grayaberas (men’s short-sleeved cotton shirts), attractive tablecloths; and hand-woven wicker baskets, blankets and rugs. Good story, Habeeb. We enjoyed it a lot. Tulum is truly the most beautiful of the Mayan ruins. 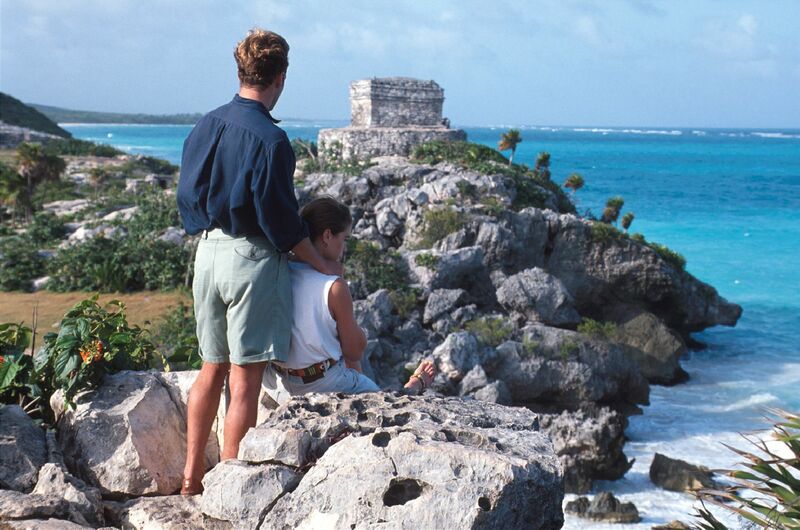 We visited several ruins when we stayed in Cancun for 9-days back in 1996. Swimming at the Tulum ruins and having a picnic lunch on the small beach there was a very enjoyable day trip. I have to agree, the Tulum area is beautiful. 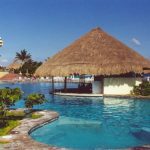 My wife and I are temporarily living about an hour north of it in Puerto Morelos, and we’ve looked into maybe staying in Tulum for a bit before we continue our road travels into Central America. One word about tips in Mexico, if it’s a service performed, they deserve a tip. Grocery baggers – usually young kids, working to help out their families and pay for school items. 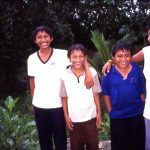 Parking lot “attendants” – although we have to sometimes chuckle at these people who wave a red flag to show us which parking spot to use, they are simply trying to make a few pesos to help support their family. Tip them. Restaurants – always try to tip 15%, most all of these smaller places are run by families trying to support themselves. Most Mexicans will go out of their way to help make you happy, and give above and beyond their prescribed duties – tip them in appreciation.